A purchaser has to be identified in all business combinations in accordance with IFRS 3. This is important because with the purchase method the net assets and liabilities of the acquired company are revalued, whereas the net assets and liabilities of the purchaser remain at book values. The purchaser is the company which obtains control over another company. Control is obtained when an company achieves the power to govern the financial and operating policies of another company, and draws benefits from that activity. Case 1 is based on acquisition of the majority of voting rights, i.e. a majority of more than 50%. Case 2 describes obtaining control where less than half of the voting rights are obtained. 4. the acquiring company has the right to exercise the majority of votes in meetings held by the management and/or supervisory body or an equivalent management body of the other company. If a purchaser cannot be clearly identified, the following criteria are to be consulted for determining the purchaser in accordance with IFRS 3. 3. If in a business combination the management of a company can determine the composition of the other company’s management, the company which can determine the composition is presumably the purchaser. 4. 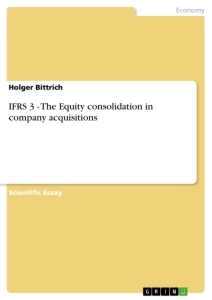 Furthermore, according to IFRS 3.B14, companies that make an identifiable payment or take on debts to pay for the capitalisation are considered to be the acquirer. 2. the management of the legally acquired company can determine the composition of the future management of the acquiring company. In the case of a reverse acquisition the net assets and debts of the legal parent company are to be recorded at fair value within the framework of the acquisition method, whereas net assets and liabilities of the legal subsidiary are continued at book values. 2. In cases of a single exchange transaction the values of the purchase price components not consisting of money are to be valued at the acquisition date. 3. The net assets and liabilities of the acquired company are to be valued at fair value on the acquisition date. 4. The goodwill is to be determined on the acquisition date. The acquisition date is the date when the acquirer obtains actual control over the acquired company. In this respect it is the economic and not the legal content which is decisive. The earliest acquisition date is the signing of the contract, and the latest is the material execution (transfer of shares). If the business combination depends on an official permission or approval by a committee, these dates may also be considered as possible acquisition dates. With a single exchange transaction the acquisition date corresponds to the date of exchange. With an acquisition in stages the exchange dates are the dates when the investments are to be recorded in the individual company accounts of the acquirer. At each step the acquired non-cash items are recorded, irrespective of the acquisition date. Since the acquisition date and reporting date of the acquired company only coincide in exceptional cases, normally interim accounts need to be drawn up showing the proportional financial result. Further, the fair values of the assets and liabilities acquired and contingent liabilities need to be determined. Cf. Lüdenbach / Hoffmann, 2006, § 31 margin no. 41 et seq. IFRS X Financial Statement Presentation – a boon or bane for the world of international financial reporting?